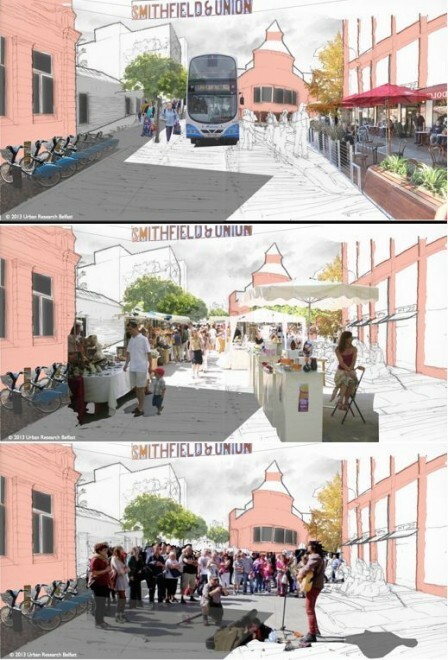 The official proposal, called Library Square, is a £3million ($5million) joint government and private-led scheme launched in November 2012. Glossy images and brochures promoted completed designs to transform the existing street into a ‘destination’ with literary-themed paving and fixed seating, tree sculptures, retail kiosks, large video screens and Wi-Fi hotspots. During the project consultation period in early 2013, I—along with other like-minded colleagues—spoke with local business owners, government representatives and residents about alternative possibilities for activating the space that would expend fewer resources on expensive surfaces. We have argued for more spending to be focused on building partnerships around the space, and managing street-level activity throughout the year in conjunction with existing amenities. I was surprised to find that others—local business owners in particular—felt we should support any form of investment in the area, and were wary that negative comments might result in no investment at all. I soon realized that starting out too negatively and playing the ‘expert designer’ card too strongly risked alienating rather than encouraging discussion. The local authority in charge of the project, Northern Ireland’s Department of Social Development (DSD) agreed to let me host a meeting in February, using their presentation boards for a public discussion between students of architecture and design, local people, and business owners. 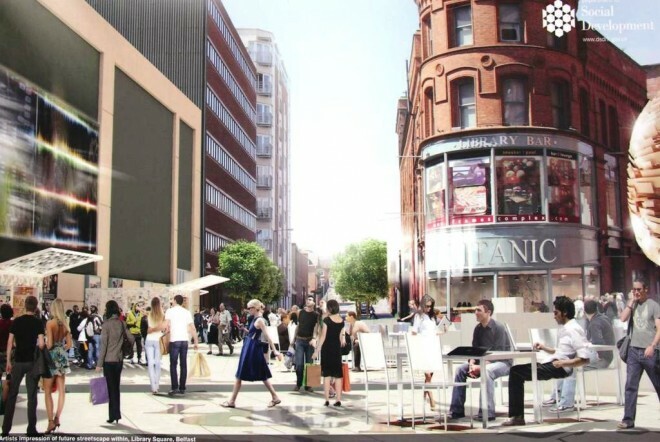 The discussions highlighted the positives of the space within and around the proposed new square: its Victorian era setting and surrounding historic buildings. We focused on how existing amenities could support a variety of street-level economic and cultural activities, and how public bodies could work with investors, property owners, and the public as partners in crafting a larger development vision. I had not planned on any further interventions but, as often happens when more people who are willing to talk across personal and professional boundaries get involved, ideas became more fluid. Together with fellow architect Arthur Acheson, Chair of Northern Ireland’s Ministerial Advisory Group, I led an unplanned walk around the site of the proposed square with some of the more skeptical business owners. We borrowed a table and chairs from an adjacent (indoor-only) restaurant and sat in the street, discussing the design proposals over steaming cups of coffee. Passers-by turned their heads in surprise to see us sitting outside in that particular street; most of them ended up smiling. We felt this suggested that, given the right opportunity, more people might join us. We agreed to take the next step and create a full-street event before the close of consultations—which was then just one week away. The leap from talk to action occurred spontaneously through this and other encounters, some equally unexpected. The lesson for me from this process was the importance of recognizing and reacting flexibly to key opportunities and people as they presented themselves. Before taking over the street, we opted to get as much legal and local buy-in as possible. 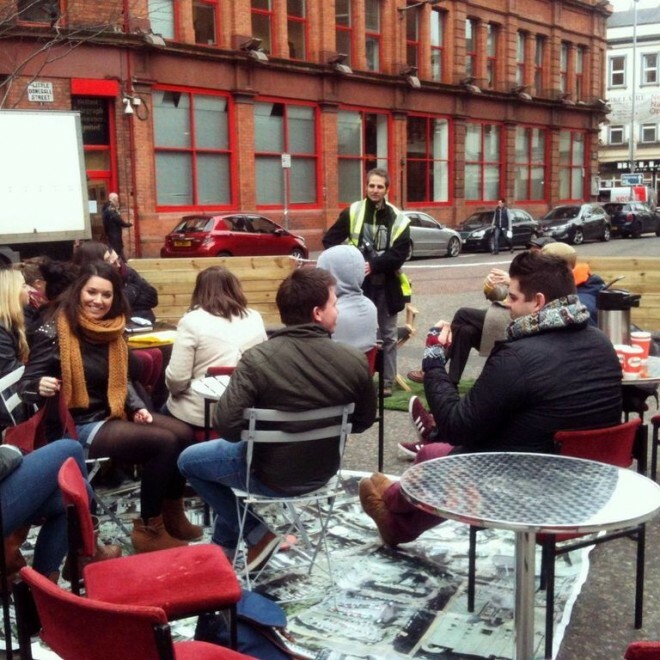 Occupying a public space in any city can be extremely contentious, and doing so in Belfast is no exception. Belfast has a long history of extremely negative sectarian conflict over sharing space as well as more recent examples of global Occupy movements in public spaces and private buildings. Knowing more about the usual bureaucracy for road closures and blocking on-street parking spaces might also have been daunting. When our aims for a temporary, ‘light-touch’ approach were explained to people, however, we found that many doors opened to help. One unexpected experience was with the Police Service, who initially had some tough questions about our plan before agreeing to meet me at the site to see the proposals for themselves. After meeting informally, again over a cup of coffee, the Constable responsible for the neighborhood took a supportive approach to lobby on our behalf, as well as to help close the street on the day of the activention. The Belfast Central Library, which faces the square and is the reason for the square's proposed name, also played an important role. The Library manger recognized how a successful space outside could be mutually beneficial for their patrons, as well as for their existing café inside. Within two days, we had approvals to proceed. I coordinated the activities, volunteers, and publicity; Arthur Acheson offered his support on behalf of MAG, along with a tent, badminton set, and chalkboard! The restaurant owner agreed to provide more tables and chairs, and some food. We also had help from a network of contributors including the Belfast School of Architecture and local charity PLACE, Northern Ireland’s architecture and built environment outreach and education center. PLACE brought in their UK-wide initiative, Somewhere To… which involves youths under age 25 in projects affecting their physical environment. PLACE also donated chairs and fake grass from another event and invited a street artist, Jane Butler, to develop specific chalk-art activities for the day. 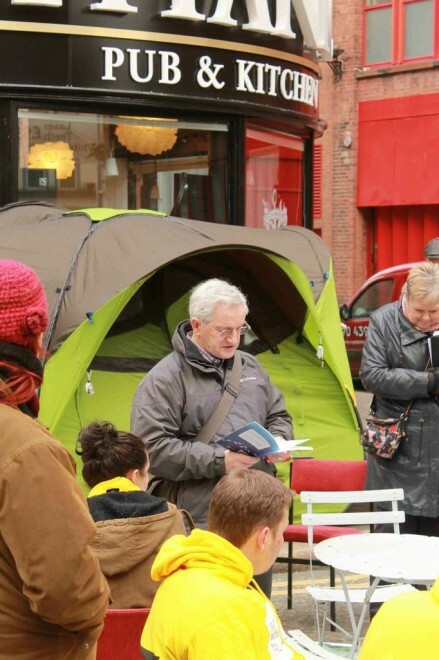 Serendipitously, we learned that a poetry society, The Shalom House Writer’s Club, had a recital planned in the Library on the day of our event, and we persuaded them to join us in the street for a live reading. I knew from my training with PPS that Placemaking is all about getting the right people on board; what I realized through this experience is that you never know where the right people will come from, so it’s best to talk to everyone! With this support, the intervention ran smoothly on February 21st, 2013. We limited what we brought, borrowing larger items from surrounding businesses. We set out areas for play and seating: hopscotch and an impromptu badminton court in the street, an old guitar to one side for budding buskers, and an ‘outdoor café’ with the donated furniture and fake grass. 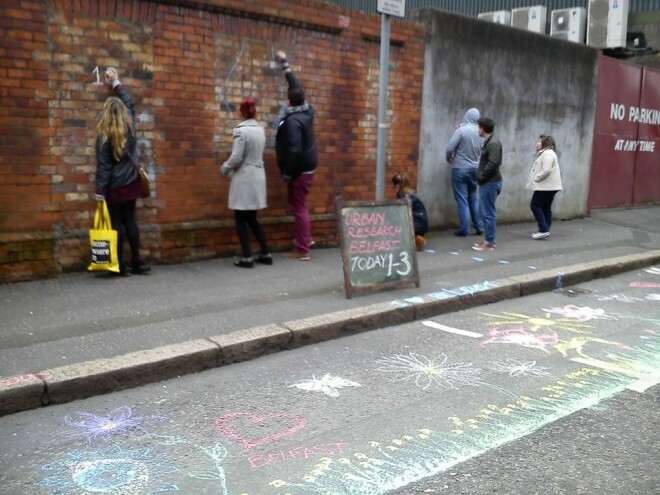 Our volunteer street artist guided others to ‘cultivate’ chalk grass and flowers over the asphalt parking spaces and up some blank walls facing the square. Despite a cold February day, a steady stream of people joined in the poetry readings, games, guitar, art, and general conversation for a few hours, encouraged by more coffee from the Library café, and sandwiches donated by a local restaurant owner. We had curious members of the public ask about the official design proposals, along with a few harmless hecklers who only added to a lively, interactive public display in a street most often used for car-parking. At the end of the day, we left behind only our inspirational and colorful chalk meadow. Even without slick marketing, we attracted attention to the space and had positive coverage in the local press about the potential for the proposed Square be a better quality place without kiosks or overly expensive design gimmicks. Some key members from DSD even ventured out to visit the activated street, and saw for themselves what we were trying to achieve. Before leaving, they let us know there could be more funding available to grow these types of events in the future, with a little more forward planning. We also received many useful comments, stories, and ideas from the public and volunteers about DSD’s proposals, including ideas for flexible uses such as street-markets or other cultural events that we compiled and submitted to DSD’s consultation. In that one afternoon, we reached a wide audience—though we remain aware of limits to what influence we might have over the official consultation process. In the months since the activention, there have been small positive steps to consider and take the comments we gathered into the next planning stages. Most importantly, running this event showed me, and I believe others involved, that limited time and resources are not barriers to taking action and raising issues about the use of public spaces. Already, my collaborators and I are now considering larger, longer cultural events to demonstrate how LQC approaches can be useful, agile, and visible on-the-ground methods to help people envision better quality public spaces for their city. Whatever the outcome at Library Square, our work there helped to spark a conversation, and will contribute to more action around public space in the future. ---- Saul is a UK-licensed architect, and also a lecturer in architecture at the Belfast School of Architecture and Design. Originally from New York, studying and working in architecture led him to live and work in a number of cities before settling in Belfast with his family a decade ago. Saul’s main practice and research interests in commercial, community and education sectors for over twenty years include investigating how designers can learn to work more effectively with private-developers toward better quality public spaces and everyday places in existing cities. He is grateful to everyone who helped make the Library Square pop-up a success, and thanks PPS Ltd and others for much of his inspiration and training.